Welcome to Lake Creek Cabin! 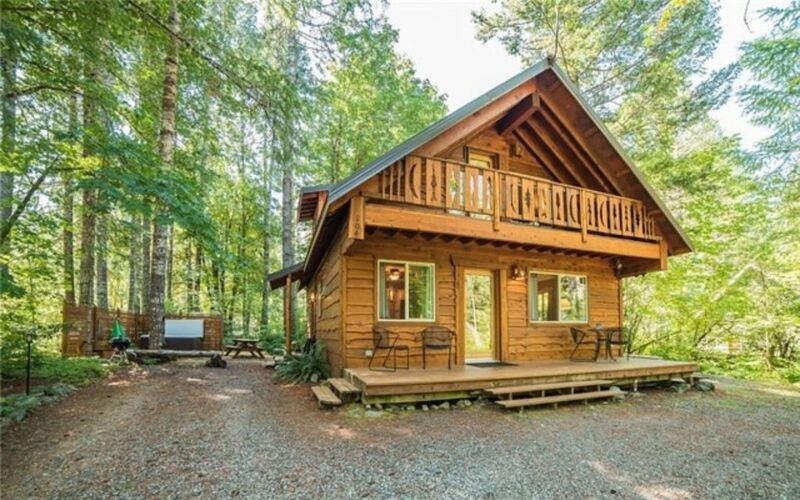 Enjoy this family friendly custom crafted cabin in the heart of Goat Rocks Community. Located just outside of Packwood, with community river access. This cabin has all of the essentials for a relaxing mountain getaway! The open Floor plan allows you to relax and visit at the same time. Cabin has 3 bedrooms, 2 bathrooms. Each bedroom is private. Master bedroom has a deck to enjoy your morning coffee, and hear all that nature has to offer. Just a short walk to the community river access, where you can swim, relax, and BBQ. Sit outside on the front deck or hop in the hot tub to star gaze. Fire pit out back to roast marshmallows and tell ghost stories. Just 15 minutes from Mount Rainier National Park, and White Pass Ski area. Multiple lakes and hiking trails nearby. Two night minimum stay. Every year my friends and I pick a place between Seattle and Portland to celebrate birthdays, and this is exactly in the middle! With a fire pit and hot tub, how could I say no? They definitely took a lot of care and planning when decorating as well. I couldn’t imagine a more picture perfect cabin! This was a wonderful home that was well appointed and convenient to White Pass. Normally, I like to stay slope side when skiing with kids, but amenities that the house provided were well worth the easy 20 min drive to the slope. Our family of 6 loved having space to spread out in the evenings, watch a movie, play a game,or soak in the hot tub. I could make hearty dinners, and breakfasts, pack ski lunches and dry damp gloves, plus get a good night's sleep before the next day. Having a grocery store 2 miles away was a lifesaver. And the river access was a nice after dinner walk. The house came with a small stash of dishwasher soap, kitchen sponge, laundry detergent, paper towels and it toilet paper. It was nice not to have to provide theses items. Towels and linens were also plentiful. Everyone was dry and cozy. No issues with hot water, heating, or parking. Close to neighbors and the road but nothing the really deteacted from our stay. Overall, we enjoyed the house and our stay and would re-rent or refer to anyone visiting the area. This cabin was just perfect for our weekend of skiing at White Pass! We look forward to staying here again in the future. Thank you so much for your review. We hope you stay at Lake Creek in the future! Very clean and it is such a pretty place to be! The cabin was perfect for my family to visit Mt. Rainer and do some sledding. It was clean, quite and had all the amenities that you would want. Thank you so much for staying at Lake Creek! We hope you stay with us again. The Lake Creek Cabin is one of our favorite places to stay. Great for a family getaway! The cabin is cozy and has all of the amenities you would want. We will definitely come again! Thanks for staying! Look forward to you staying in the future!